— “The 33 Most-Watched Cat Videos Ever,” from YouTube. 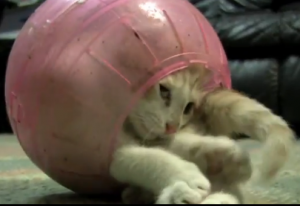 The first one shows a kitten stuck inside a plastic ball. Takes about two minutes to get out, to the tune of Paul McCartney’s “Stuck in the Middle with You.” Everybody loves kitten pictures.